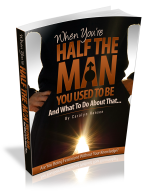 Grab Our FREE Report "Half The Man You Used To Be" Right Here! Informational material found at the Strong Men Stay Young website is provided for educational and informational purposes only and is not intended as nutritional and exercise advice to supplant medical advice. The information contained within this website should not be used to diagnose or treat any illness, hormonal disorder, disease or health problems.